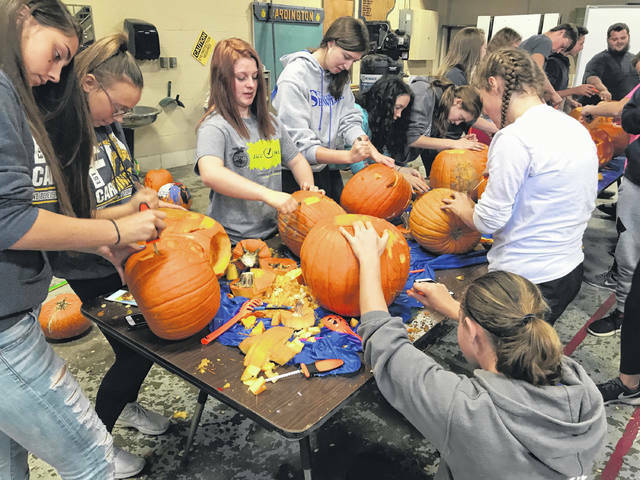 Cardington FFA members carve pumpkins for Woodside Village residents. Cardington FFA members recently interacted with two groups. On Oct. 29, they spent the day carving pumpkins of all shapes and sizes and on the following day they loaded a bus and headed for Woodside Village. They spent the evening delivering pumpkins and visiting with residents. This is one of the Cardington FFA chapter’s favorite events, considering their purpose is living to serve. The members look forward to this event each year. On Nov. 2, the juniors and seniors in the FFA chapter, interacted with Cardington Elementary students at Fall Harvest Day. They talked to the elementary students about how apple cider is made and they pressed apple cider for the students. The young students also got to play farm animal themed putt- putt where they learned facts about animals at every hole. There were suppose to be a hay ride that day but weather conditions caused a cancellation but the FFA members continued to hang out with the young students. Chapter members visited classrooms and joined in the individual classes’ fall activities for that day. Seventeen Cardington FFA members left Cardington Schools at 7:15 a.m. on OcT. 24 and traveled to River Valley High School where they picked up FFA members and headed to Wilson Sporting Goods Factory for a tour of the factory and met up with Eastwood FFA members. Arriving in Indianapolis, they attended session one of the 91st National FFA convention and listened to an empowering speech by keynote speaker, Kyl Scheele. The group ended that first night jamming out to Garth Brooks at Lucas Oil Stadium. Delisa and Dylan Goodman, represented the Cardington chapter in receiving the 3 Star Chapter Award, the highest ranking an FFA Chapter can receive.